Music lovers certainly have it good nowadays, what with the huge number of music providers available on the Internet. Among some of the more popular providers are eMusic, Rhapsody and Last.fm, and there are many more besides that offer music fans a quick, easy, convenient and affordable way to access music from a wide variety of different artists. Let's take a look at some of their highlights. eMusic requires users to register at the site and download the download manager software, after which the music files are stored on your computer. The service also includes a search facility, which although a bit clumsy and cumbersome, does a good enough job of seeking out your favorite artists. Rhapsody of course has its own music player powered by Real. This makes it a breeze to import and play your music collection. You do have to set up an account and register before you will be able to use the service, although you do get the chance to listen to quite a few songs for free. Rhapsody also offers a much better search facility than eMusic. Last.fm also offers its own player, although you may be tempted to ignore it if you already have another music player. Nevertheless, it is worth considering if you end up listening to the station extensively later on. The best feature of Last.fm is its ability to make suggestions based on your listening choices. eMusic has a come a long way since its introduction in 2005, when it hardly registered a blip in the online music radar. The service has since matured quite nicely, and it is now a very capable and easy to use program. Also greatly adding to its flexibility is the fact that all the music is offered in MP3 format. Rhapsody's biggest drawback is that most if its music is in WMA or RAX format, with only a few offered in MP3. The good news is that many players do support the WMA native format, so you get almost the same compatibility as with MP3. Last.fm has quite a few requirements for the user, although you admittedly get a lot in return. You don't necessarily have to use their player if you don't want to, and it is easy enough to play tunes and browse through the suggestions right from your browser. The biggest downfall of eMusic as far as music selection is concerned is the relative scarcity of major label artists, although users with more esoteric tastes may actually appreciate this. In any case, the service does have almost three million tracks in its roster, so there is plenty to keep you entertained, especially if you have a taste for the esoteric. Rhapsody on the other hand has no less than four million songs in its catalog, making it one of the largest music services around. 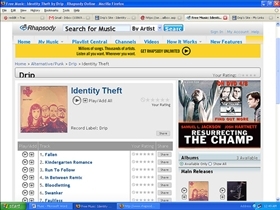 Last.fm for its part also boasts of an extensive music selection, although its biggest strength lies in its ability to recommend music based on your listening habits. This makes Last.fm ideally suited for discovering new music online. Best source for online music? eHow vs. HubPages: Which is better?